This past fall I spoke at Content Marketing World in Cleveland and I had a chance to get a signed copy of the book written by the founders of Content Marketing Institute and the conference. Killing Marketing, by Robert Rose and Joe Pulizzi is the marching orders most marketing leaders need to adopt immediately or risk becoming obsolete. 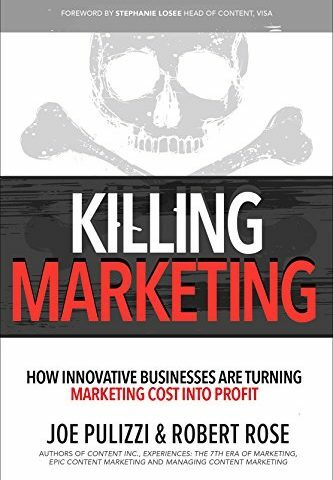 While a title that calls for killing marketing might not appear to be an actual book on how to do better marketing, this is exactly the point that Rose and Pulizzi are attempting to make. They believe that marketing with the goal of driving more sales has gone off the rails, and marketing as we know it has to be killed off in order to start over again. Rather than look at marketing as the tool dedicated to driving the rest of the business, marketing itself can be a revenue center. They detail powerful case studies of companies who have developed audiences to do just that. The two examples which I found to be the most interesting were Arrow and Johnson and Johnson. Electronics maker, Arrow Electronics used to find new customers by advertising in printed electronics media. As they watched this media go the direction of all print media, they found themselves missing a valuable means to reach their customers. Faced with this reality, Arrow created their own media online which became a profit center as they sold advertising to partners and even competitors. Johnson & Johnson is another great example with their site babycenter.com. Any new parent seeking advice online likely found BabyCenter and had not even realized that this site is fully owned by a Fortune 500 company. The site is operated fairly independently from the rest of Johnson and Johnson and monetizes itself research and advertising. The glaring question that the book does a great job of answering is how marketing of this form will generate positive ROI. Both Arrow and Johnson and Johnson are driving revenue for the core company from their marketing, and the authors believe anyone can see similar results. Obviously, there are many opportunities for indirect revenue like driving sales by increasing the brand which is the older form of marketing we are more used to. The book closes out with a plan for anyone to follow on how to set up their own content efforts. There are suggestions on evaluating whether to build or buy a new marketing channel, examples of what constitutes an audience and how to build the business model. To me the most compelling part of the book was that the authors were not just preaching, they had lived their advice. They had created a successful company (the Content Marketing Institute) who’s marketing was content people wanted, a conference built around that audience (Content Marketing World), purchased a marketing a channel (the Content Marketing Awards) and all around had so much first person experience on this topic. In short, this book is a great read for anyone that is aware that they need to change their marketing paradigms so audiences want to pay attention. It is packed full of great advice and examples. If you want to learn from people who have navigated this journey of changing marketing from the old boring model to one that people enjoy as a product, go out and get this book now!